Hitting the sweet spot between over- and underpacking is one of the trickiest travel lessons of all. Even seasoned travelers can find themselves with an overstuffed suitcase that weighs them down or, on the other end of the spectrum, having to repeat the same outfit over and over again because they didn't pack enough options. If you've ever experienced one of the two aforementioned extremes, then you know how life-changing it is to master the art of packing light while still feeling prepared and stylish. 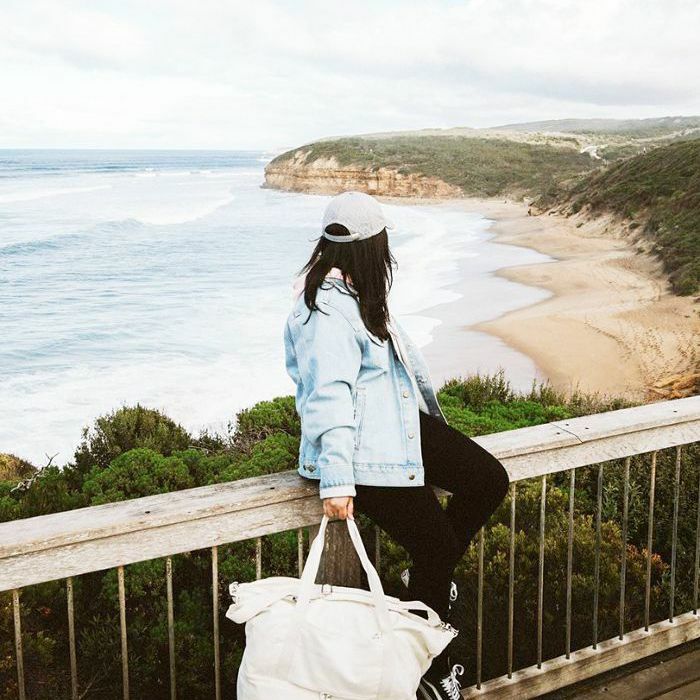 To help you learn how to pack light while still having everything you need for a fun, easy, and stylish trip, we gathered up the tried-and-true travel tips that actually work, no matter the destination. Not to mention, packing light means you'll have more space in your bag for new finds. So scroll through to learn how to pack light once and for all. If you're looking to invest in a carry-on, look out for options that contain compartments. These come in handy if you have trouble staying organized and also help you keep track of what you've already put in your bag while you're actually packing. Oh, and save the slimmest, most lightweight layers for last, since it'll be easier to zip the bag with those on top. Will it not fit when you lay it down flat? Try rolling it instead. Before we even get to the packing hack part, let's talk strategy. Another thing you need to do in advance? Consult a packing list. Though it can feel like a waste of time, we assure you that keeping a list will make sure you don't under or overdo anything. And if you think you're forgetting something, you probably are—here's a list of things we often forget when packing to help you out. Aside from keeping track with a checklist, visual your outfits ahead of time and do some math. For example, if you're traveling somewhere for three days and two nights, make sure you have a fresh look for each day, plus a simple way to transition the same outfit from day to night, like swapping a button up for a lightweight going out top, or a dress that looks party-ready once you ditch the blazer. That chunky knit? Those bulky sneakers? A stiff straw bag? All the bangles you've ever owned? These are the kinds of items that take up an unnecessary amount of space. If you insist on bringing them with you, consider wearing them on the flight to free up space for other essentials. This is a good rule to follow even if you aren't just packing a weekender bag or a carry on because checking an overweight bag can make things exponentially pricier. On a similar note, items in a neutral tone are also good because you can mix and match them again for new outfit combinations that won't clash. If you love color, lay out all your items on the bed before tucking them into the suitcase and make sure that they each fit into one of two (or three, depending on how large your suitcase is) color schemes, so you don't waste valuable space with a random top that doesn't match with anything—no matter how cute it is. Though switching up your shoe game is an easy way to diversify a repeating jeans-and-shirt combination, it's actually much wiser to pack an extra button-down or T-shirt since they take up less space. Sadly, shoes simply tend to be the bulkiest items. If you can, opt for a pair of flexible flats or sandals that can be stacked on top of each other, plus one pair of dress shoes (if the previous ones don't double as something formal) and then wear your boots or sneakers on your travel day. If you're one of those people who just won't strip down the skincare and beauty routine while traveling, then go to a drugstore before your trip to purchase travel-size bottles. Transfer your larger products into these tinier bottles and put them all in a toiletries bag. They'll likely take up much less space than the large bottles, and you'll know exactly where to find them. If you're traveling on a plane and have more than three items, it's okay if you have to bring both a tote bag and a purse (especially if you're traveling with electronics that could stretch your purse) along with with your roll-on suitcase. Simply place your purse on top of your tote when you're about to board the plane. Up next, an editor shares your go-to travel outfits.